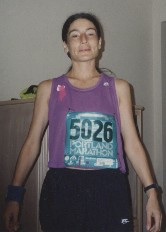 My mom getting ready to run the Portland Marathon. I am very thankful I was there to support her. I learned that it really is a long process to be featured in a magazine article. Leslie posted that comment on my blog on October 9th and the article was published in the May issue. The first step was answering a few questions through e-mail. Then I waited quite awhile and nearly forgot about it when she responded and said that the editor was interested in the story. After a few more weeks, we set up a time for a phone interview where she asked Kailey and I more detailed questions. At that point, she told me it would be a feature about three different mother-daughter duos. A mother-daughter duo who beat cancer and a duo who lost weight. Honestly, I didn’t quite feel like our story was up to par with those amazing stories of inspiration. A few more weeks went by and I was asked some more follow-up questions via e-mail. Then I had to submit photos. Then there was a fact checker who wanted to make sure names, dates and information were correct. Soon there were no more questions or e-mails and I just waited for someone to notify me that the article was out. Last week I went to pick up my daughter at preschool and her teacher came out with a magazine in her hand opened up to a picture of Kailey and I. I remember her saying something like “look, you are famous!” I didn’t get a chance to read the article until we made a trip to Target later that day. I was very impressed with Leslie’s article (and she did contact me a few days later to let me know that the article was out). It was kind of awesome that it came out just before Mother’s Day. The most important part for me was paying tribute to my mother. I believe that she would be proud if she could see me now. I am fortunate to be able to share her story with the world (or whoever happens to like homes and gardening). Sometimes I am sad that we don’t have 3 generations crossing the finish line together, but I will do what it takes to make that happen with my daughters (and their sons or daughters). Yet, it is still a story about a legacy being passed down… my mother’s running legacy. I enjoy sharing it with my girls now. Thank you for your support in reading my blog. Here is a link to the article if you are interested in reading it without the homes and gardens to browse through: “I’m Healthy, Thanks to Mom” by Leslie Goldman. 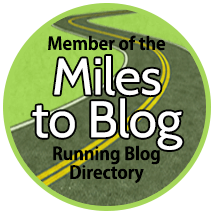 This entry was posted in Running Experiences and tagged Better Homes and Gardens, I am healthy thanks to mom, Leslie Goldman, Mother's Day 5K, mother/daughter duos, mother/daughter runners, running, running with mom. I just read your blog. I found my wayto your blog via my Better Homes and Garden magazine. I want to tell you I found your article inspirational about your moms legacy. Thanks Jessica! Running takes a lot of patience and dedication, but it is well worth the effort! It definitely helped me lose my baby weight… 3 times! Good luck to you on your journey!